100% Privacy Guaranteed and No Spam. 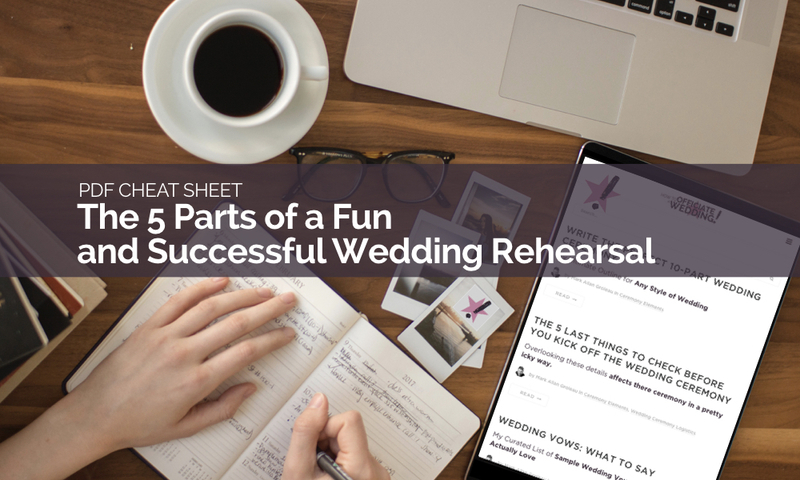 Yes, it’s possible: a wedding rehearsal can be successful and fun, even! What does a successful rehearsal look like? It means the couple, their parents, their wedding party – everyone knows how to walk and where to stand during the processional and the ceremony on the big day. They feel confident and sure of their unique part and their place in the event. How about fun? Well… practicing a thing can be very unfun, frustrating, and mundane. But at a wedding rehearsal, as long we officiants are directive, patient, and always communicating what’s going to happen and what’s happening now, the ingredients are already baked in for a good time! After all, the room is full of family and friends who love each other and are primed for a weekend of partying! And the rehearsal is usually the first time all those people are in the room together for the weekend. A great officiant fans those party-flames from the start of the rehearsal. So how is it possible to achieve both fun and success in a wedding rehearsal? Here are my 5 ways. There are two parts to this step, and both parts happen before we kick off the rehearsal proper. First, we need to discuss with our couple where our rehearsal will be held. If the rehearsal will be in the same space as the wedding, then there’s not much else to think about here. But I’ve been in plenty of situations where the venue is not available for the rehearsal. Do we cancel the rehearsal? Heck, no! It means we do it in the rehearsal dinner restaurant, a courtyard, a public park, a condo party room, or Mom’s living room. Doesn’t matter! We just need a space large enough to walk down the pretend aisle and stand at the pretend front. Okay, so let’s say we’ve decided on a suitable place with our couple. The “assessment” part ain’t over! When we arrive at the rehearsal site – whether it’s the actual wedding venue or someone’s back deck – we need to do a little logistical thinking before we call everyone to attention. So let’s assess the rehearsal space we have to work with, whatever it is. We need to figure out where we can marshal everyone at the back for the processional, where the aisle will be (and throw down a couple of markers if the chairs aren’t in place yet), and make sure the front is wide enough for both wedding parties to fan out as they will on the big day. The standing is one of the most important parts to practice and get right. A few years ago I was a groomsman at a destination wedding. Meaning: the wedding rehearsal happened in the hot sun literally a few feet from the rolling beach of the Caribbean. The officiant started the rehearsal without addressing us. He just launched into asking the bride and groom a whole bunch of questions and figuring things out while we baked away, and then eventually got around to us where to go and what to do. We had no idea what his plan was, how long we’d be there, or when it would end! And the most excruciating part was all the people swimming in the surf and sipping margaritas just a shell’s-throw away. Like… when can we get outta here, please? There’s nothing worse than being obligated to attend a thing and not have a clue what’s going on or when it’s going to be over. Let’s not put our couple and their friends and family through that! A great officiant starts the rehearsal with a brief self-introduction and then gives everyone a rundown of what we’re about to do, how we’re going to do it, and exactly how long it will take. Okay, you’ve told everyone what’s going to happen and you’ve made “us” feel like a team who are in this together. Now it’s time for us to cover how we execute the 3 parts of the rehearsal, and do it well. Here’s what an unfun rehearsal looks like: the officiant reads every word of the ceremony while everyone looks on and waits for the part that’s relevant to them. There’s no need for that here! It’s not a rehearsal for the officiant. It’s a rehearsal for everyone else! The first part of the rehearsal is the talk-through. But it doesn’t mean reading every word! What we’re doing here is familiarizing everyone with what the ceremony is going to look like. It’s the 30,000-foot view of what happens from the moment we line up at the back to the moment we recess down the aisle at the end. Essentially, we’re briefly talking through the major sections of the ceremony, A to B to C to D. Kinda like explaining the plot of a movie without including the dialogue. We accomplish this by bringing a full copy of the ceremony in with us and reading through all the stage directions, explaining who lines up behind who, who comes in when, where they go, and how they sit or stand. Look to the couple for constant assent and make sure they know they’re still free to change anything that’s not quite perfect. Ask questions when you’re not sure of something, and invite feedback. We want to be directive, but not bullies or know-it-alls. And let’s always remember this maxim: it’s not the officiant’s ceremony. It’s the couple’s. People will have a ton of questions as we talk it through, but don’t get bogged down. We just remind them: this is only the talk-through. The walk-through is where we’re gonna iron out all the minute details and when the muscle memory will kick in. This part takes about 10 minutes, and then we can move on to Part 2. When the talk-through is done, the first thing we do is line everyone up at the back in the order they’ll be walking in, and we move through the ceremony. Again, we’re not reading any of our speech or the vows. In the walk-through, we’re signalling people’s cues, checking their walking speed, making sure they’re standing symmetrically, and practicing the moving parts. act out the ring exchange so the person holding the rings knows when he or she needs to present them and so couple knows how to put the rings on each other’s fingers. To achieve rehearsal success – everyone feeling confident and sure about their part – we practice every occasion in the ceremony where people are moving from one place to another or doing something with their hands (ring exchange, signing, etc). The walk-through takes about 25 minutes total, and then we can wrap up with Part 3. At this point in the rehearsal, people are getting pretty done. So here’s where we pep them up good! We tell them the next part – the re-run – will only take about 4 minutes. And we assure them they’re about to blow their own minds. In the re-run, we’re essentially proving to everyone that they know exactly when to come in, how to talk, where to go, and how to stand. So we do exactly what we did in the walk-through, but we’re not prompting, directing, or adjusting folks unless absolutely necessary. Our couple and their parents and party move through their paces while we say things like, “The music starts,” and “Now I’ll say it’s time for the ring exchange,” and “Then we go sign,” etc. It’ll be a thing of beauty. And then about 4 minutes later, we’re done! This model for a wedding rehearsal means everyone knows what’s going on at all times and they’re free to have fun. Going from talk-through to walk-through to re-run means everyone goes from having no clue, to physically learning their parts, to gaining the confidence that they’re gonna shine. Now that’s a successful – and even fun! – wedding rehearsal. Grab this post as a pdf cheat sheet! Success! Now check your email to confirm your subscription. Click here to go back to the blog. How do you do your wedding rehearsals? ‘Ever seen or done other elements of a wedding rehearsal you really liked?